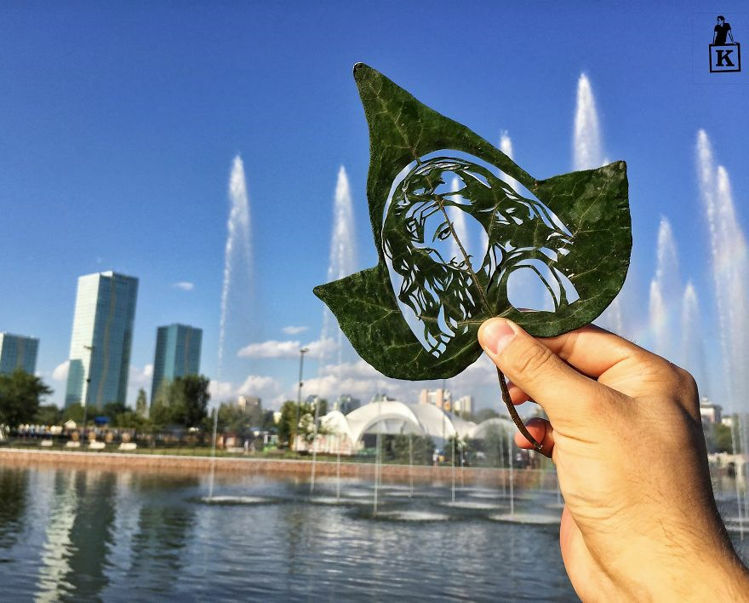 Kazakhstan-based artist Kanat Nurtazin describes his leaf cutting art as a way of giving tree leaves a second life in which they can tell a new story through his intricate designs. Four years ago, Kanat Nurtazin embarked on an project he named “100 Methods of Drawing” for which he experimented with various ways of expressing his artistic talent. It was through this project that he discovered leaf cutting, which became one of his favorite techniques. He likes the ephemeral nature of tree leaves, the fact that, much like human lives, they are perishable, but also that he can breathe new life into them as a medium to share stories with his audience. The Kazakh artist starts by searching for intact tree leaves suitable for his designs. He then glues them onto pieces of thick paper to make them sturdier and more durable, draws his designs on the paper, and uses a razor to cut the leaf. But his work isn’t complete until he finds a suitable backdrop for each of his carved leaves, to help him tell his story. For the final step, he takes a photo of the cut leaf from just the right angle and shares it with his Instagram followers.